Computer programming and development is one of the fastest growing industries in the modern world. It is an important part of almost every single other industry, as anything with a computer system of any sort will need programming. And that leads to having most in demand programming languages. For example, modern farm machinery has self-driving systems. These need programming. Likewise, any sort of modern device – think smart phones, computers, gaming consoles, and more – all need programming by an experienced developer. As you can probably guess, there is a lot of work for programmers throughout the world. This has led to something of a shortage of programmers in recent times, especially for the most used programming languages. For the purpose of this article, we have identified some of the most in demand programming languages. 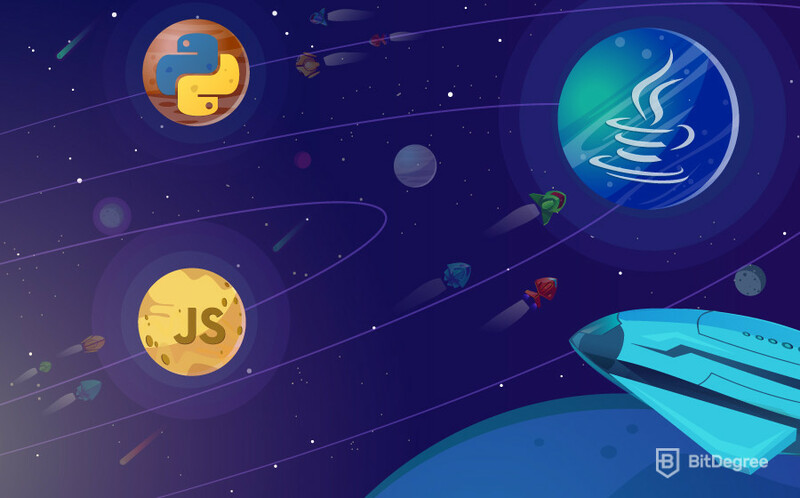 We believe that you should be able to find the most useful programming language for you to learn within this list, especially if you are thinking about learning your first language and trying to get a job as a developer. 2 What Should I Think About When Choosing A Language To Learn? 3 What Are The Top Programming Languages 2018? 4 What Languages Are Rising In Popularity Fast? There are many reasons why you should think about learning one of the most in demand programming languages. They are useful, they can give you the chance to change career paths, and they can make you more employable and more valuable to your employers. Learning one of the most in demand programming languages will mean you always have job opportunities. The most in demand programming languages are in demand for a reason – they are popular, widely used, and experienced developers are scarce. A programming language can help you advance your career. If you already have a decent job, but your career seems to have come, consider learning one of the most used programming languages. Doing this could provide the spark that you need to get a promotion or a new job. A good programming language could be your key to self-sufficiency. Learning computer programming and coding skills could open up huge freelance job opportunities for you. You will also have the chance to use your new knowledge to start developing your own apps or websites, potentially becoming self-employed. As you can see, there are a lot of good reasons why you should consider learning a new programming language in 2018. Make sure that you think carefully so that you can choose the most useful programming language for you – more on this below. What Should I Think About When Choosing A Language To Learn? Choosing a new programming language to learn can be very difficult, especially if you are thinking about learning your first language. 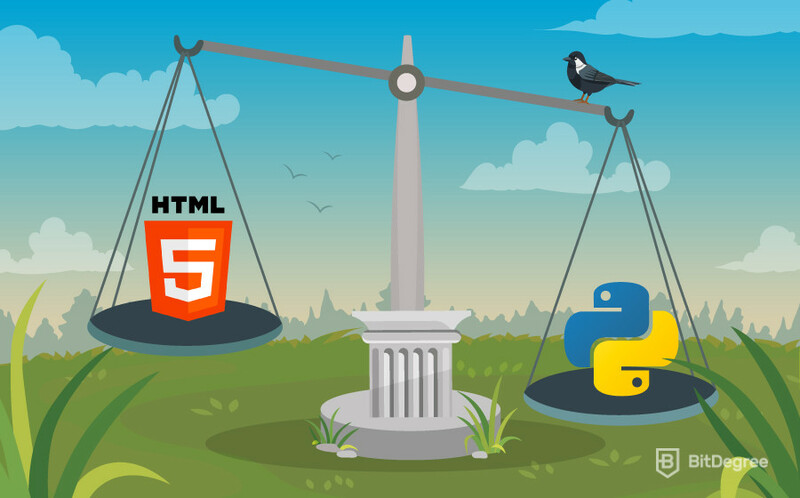 Do you choose one of the most in demand programming languages? Do you try and choose the language that you think will top the list of the most used programming languages in the future? Or, do you try and learn one of the up and coming languages which have the potential to become widespread in the next couple of years? What do you plan on using your language for? If you’re learning a new programming language as a hobby, with the hope to build your own website or app in the future, then you will probably want to start with a versatile language like Python or Java. However, if you are looking at getting into a specific job – such as consumer data analysis, which requires SQL – you will need to learn a specific language. How much time do you have to commit to it? If you are fully committed to learning a language and are willing to spend a lot of time on it, you shouldn’t be afraid to attempt one of the more difficult language like C# or C++. However, if you are doing it as a hobby, you should probably stick to a simpler language like Python. As you can see, there is a lot to consider when you are choosing which programming language to learn. Make sure that you do your research, speak to an experienced programmer who knows what they’re talking about (if possible), and take your time choosing your new language. What Are The Top Programming Languages 2018? For the purpose of this article, we have defined the ‘top programming languages of 2018’ to mean the most in demand programming languages. We have drawn on a range of sources when deciding which languages should make this list, and which ones simply don’t make the cut, including Google trends and Indeed.com job postings. We considered how popular a language is among people learning new programming skills. The demand for experienced developers was taken into account, as was the future prospects for each language. Once we finished crunching the numbers, the following seven languages were identified as the most in demand in 2018 (Languages are in no particular order). PHP is known as the language of the internet, and for very good reason. Designed for website development, it is arguably the most used programming language in the world right now. Although it is slowly falling in popularity, PHP is still used on over 80% of the websites on the internet, meaning that there is going to be a strong demand for developers for years to come. One of the most unique features of PHP is that it can be embedded directly in HTML. Instead of having to use complicated syntax to jump back and forwards from HTML code like you would if you used a language like Java or Perl, PHP code can be written directly into the HTML. This means that you can jump in and out of ‘PHP mode’ quickly and easily. PHP is a very good language to learn if you would like to become a web developer of some sort. The BitDegree learning platform offers two popular PHP courses. The first, Learn PHP Online, will teach you the basics of the language and how to use it. The second, Become A PHP Specialist, goes into more detail about back-end web development and how PHP can be used to develop websites. C#, or C Sharp, is a programming language that is derived from C. Designed by Microsoft to run on the .NET platform, C# has long been one of the most in demand programming languages. Although it has been slowly declining in popularity over the past few years, it is still definitely worth learning. As an object-oriented programming language, C# is widespread in video game development and programming. If you would like to get into this sort of field, then you will need to learn C#, and probably a number of other languages. In general, C# isn’t a good first language to learn. It is difficult, hard to follow, and it has a limited amount of uses. However, if you have a programming background and are looking for something to add to your resume, then C# is definitely a good choice. The fact that it has made our list of the most in demand programming languages of 2018 means that there is plenty of work out there for C# developers, offering increased job security into the future. If you do decide to learn C#, make sure that you do your research and choose a decent course. As noted above, it is quite a difficult language to learn, so making sure that you are taking a high-quality, reputable course will help increase your chance of success. Good old Java, one of the strongest programming languages for the last few decades. Java is a very versatile language which can be used for a whole lot of different things – including Android app development and back-end website development. The vast majority of Android apps are based on Java, while a huge percentage of the world’s biggest websites use it to build their website back-ends. One of the best features of Java is that it is completely compatible with any hardware or operating system due to the Java Virtual Machine (JVM). Its syntax reads very similar to English, which makes it quite an easy language for beginners to learn. If you want to learn a programming language which is not only among the most widespread in the world, but which is quite easy and which there are a lot of jobs for, then learn Java! BitDegree offers a great interactive Java course, Learn Java 101. Designed for beginners, this course will get you started on your journey to programming guru. It will teach you what you can do with Java, how to code with Java, and will give you an introduction to back-end web development using Java. Although a lot of people believe that Perl is useless in the modern world of programming, they couldn’t be further from the the truth. Luckily for you, this mindset has caused a distinct reduction in the number of people learning Perl over the past few years, resulting in a large demand for developers. Perl is a very flexible language which is not dissimilar to the more widely used Python. Its versatility is one of its main positive aspects, as it allows programmers to develop a program the way they want to, rather than the way the language wants them to. While it may not be the most popular, Perl is definitely one of the most in demand programming languages in the world. The lack of people learning it has resulted in a shortage of developers, which makes it a great language for you to learn. Note that its flexibility means that you need to have a very strong understanding of it before you will be able to use it successfully, but don’t let this scare you away. After all, some of the largest companies in the world use Perl as part of their programming toolkit – you would be stupid to let its bad reputation scare you away. It reads similarly to English, which means that it is quite easy to follow the code and to debug mistakes. It is super versatile, which means that it can be used for a wide range of things. It is in demand, which means that you won’t have any trouble finding work at the end of your course. As you can see, there are plenty of reasons why you should learn Python. In fact, it is the most popular programming language taught in schools. Add to this the fact that it is at the forefront of developing technologies like artificial intelligence and machine learning, and you definitely have one of the most in demand programming languages of 2018. Python is a great language to learn if you are a beginner with no coding background. If this is you, take a look at the BitDegree Python courses. The first, the Python Tutorial, will teach you the basics of Python code and how you can use it to build simple programs, while giving you the chance to practice your code as you go. 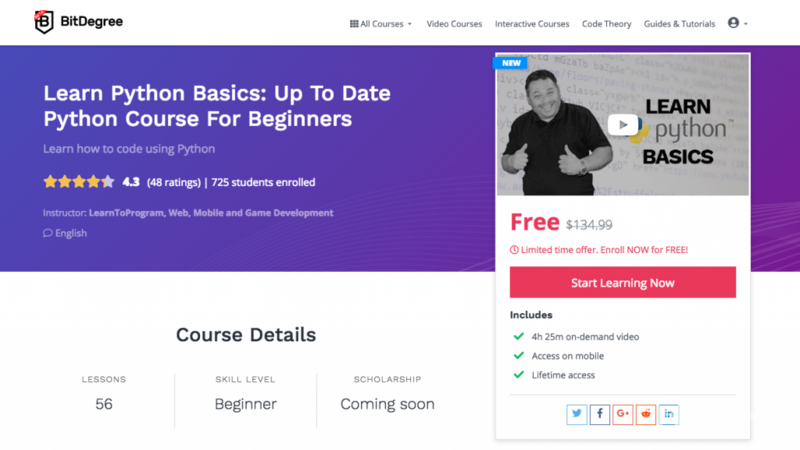 The second, the Learn Python Basics video course, will teach you how to code with Python, along with some of the most popular use cases. Although C++ probably isn’t a language which most people would expect to see on a list of the top programming languages 2018, the fact is that there are a lot of jobs out there for C++ developers. This certainly puts it into the category of the most in demand programming languages. The main reason why C++ developers are in such high demand is probably because it is so difficult to learn. In fact, it makes other ‘difficult’ languages like C# look easy. Like C#, C++ was developed from the old C language, and it has grown in popularity since its release. C++ has a wide range of uses, including in game development, client-server app development, software driver development, and system software development. It is an extremely precise language which takes a lot of time and commitment to master, which means that it probably isn’t the best choice for a beginner who has little programming experience. If you do decide to learn it, make sure that you choose a decent course by a reputable learning institution. Google search trends for the top five languages for the last five years. What Languages Are Rising In Popularity Fast? GO – Go, or Golang, is a relatively new language which was developed by Google. Go is a modern language which is designed to help programmers overcome hardware limitations which are undoubtedly going to become more widespread in the near future. Go is gathering momentum, and is poised to slingshot itself into the top few programming languages in the world in the next couple of years. Swift – Swift was developed by Apple to facilitate easier iOS app design. It allows programmers who want to develop iOS apps to do so without having to learn the difficult C languages. It is quite simple to learn, super easy to use, and is a very good choice for beginners who want to get into iOS app development in the future. Solidity – Solidity is a language which most people wouldn’t have heard of – even in the programming world. It is currently the most used programming language when it comes to blockchain development. Specifically, it is used to create smart contracts which are executed on the Ethereum blockchain. For more information about and to learn Solidity, head over to BitDegree. It is obvious that there is a lot of work out there for experienced programmers and developers. They are in demand for almost every programming language with widespread use cases, which makes programming one of the most exciting industries to get into. We have explored some of the most in demand programming languages in the article above. Learning any one of those, or of the three ‘up and coming’ languages that we identified, should set you up for future programming success. They will make you more employable, will help you advance your career, and they may even allow you to build the next viral app or website! Once you have chosen a language to learn, you need to think about how you are going to learn it. Get your hands on as many resources as possible. Watch videos on YouTube, try and speak with experienced programmers, and choose a good tutorial to teach you the basics. There are a wide range of resources available for different languages at BitDegree – take a look today!